Yes, I want to INSTANTLY rejuvenate my body and mind! I can ORDER NOW and SAVE $90! 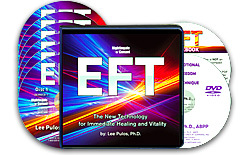 Please rush me Dr. Lee Pulos' 12-session program, EFT: The New Technology for Immediate Healing and Vitality, plus an instructional step-by-step DVD showing the real power of EFT, and a writable PDF guidebook — today for the discounted price of just $69.95 ($90 off the regular price).